TechSpot: Windows Server; A Service is Hung at Starting or Stopping State. Windows Server; A Service is Hung at Starting or Stopping State. A Windows Server service can be hung due to many reasons, its status will be 'Starting' or 'Stopping' state, and you wont be able to restart the service as most option at GUI mode might have greyed out.You can use 'TaskKill' utility to fix this issue. Find out the actual process name of the Service which is hung. 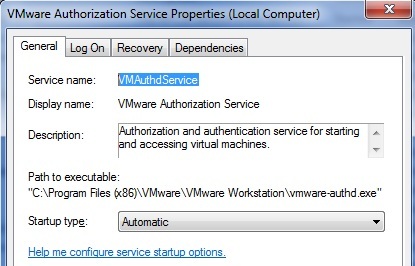 As seen in the below picture, the actual service name will be 'VMAuthdService'. taskkill /F /FI "SERVICES eq VMAuthdService"
In addition to this, you can find out the process related to the service using 'TASKLIST' command and kill the particular process. But you should know the process name.